Take John Wayne and the Roman Empire’s love child, splice in Tolkien by way of Mark Twain and you’ll have an idea of the flavor of John Hornor Jacobs newest novel, The Incorruptibles. Taking place on an Earth where the Roman Empire never fell, we follow Shoe and Fisk, friends and mercenaries, on a laid back assignment: protect a prominent Ruman (not a typo) Senator and his family while they travel down a mighty river in their version of North America. But things take a turn for the worse when Shoe and Fisk get embroiled in local politics, and have to rescue a mysterious guest of the Senator from the Vaettir, a native population of immortal elves that use incredible violence to fend off the encroaching Ruman colonists. Throw in demons, hellfire bullets, a little romance, and an ever shifting political landscape, and you’ve got The Incorruptibles. I’d been meaning to read Jacobs’s work for some time now and this was a great introduction to his style. A compelling voice, brilliant worldbuilding, huge stakes and prose that cuts and soothes in equal measure. His character work is fantastic, and while Fisk remains the aloof cowboy, even as you learn more about him, it’s Shoe, the half-Dvergar (the dwarven people of the world), half-human compatriot who lends this story a compassionate voice and an enormous heart to go along with the violence and politics. Verdict: Must Buy, Especially If You’re Looking For Fantasy With A Western Twist. Also Demon-Powered Riverboats. This is a book to look at for the next round of award ballots. 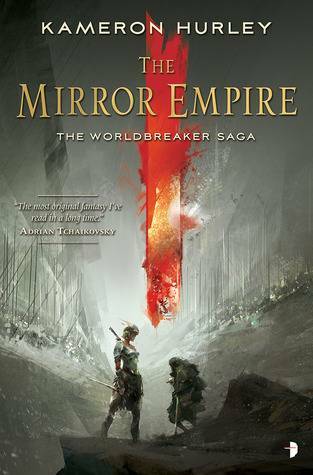 Hurley’s fourth novel, The Mirror Empire is an intense exploration of warfare, family, consequences, and history, as a world is invaded by its alternate half across space and time due to the dark star Oma rising. Hurley takes us through the realities of brutal warfare, of unprepared nations and peoples pushed to the brink, and the power and resilience that can come of being confronted with your worst fears and accepting them. Along the way, Hurley delivers on a beautifully imagined, concrete world, taking as much time to paint empires of aggressive matriarchies and cultures of five different genders, as she does exploring magic derived from heavenly satellites and carnivorous, semi-sentient walking trees. The more I heard about this novel, the more excited I became. It absolutely delivers. Hurley manages to balance plot, worldbuilding and character, while exploring issues of gender, race, class, violence and more, in organic and eye-opening ways. She also explores and subverts character tropes, resulting in new takes on old archetypes: the young chosen one, the bitter, old mentor, the young person thrust into power. All of these and more are turned on their head to wonderful results. Hurley plays it fast and loose in many parts, and while that can sometimes cause a little whiplash, it pales in comparison to how powerful this book is. The gods are dead. This is what comes after. Years ago, the Kaj of Saypur found a way to kill the gods of his oppressors. These Divinities had granted their followers great miracles, lives, and cities, the greatest of which was Bulikov, the capital of the Continent. But when the Divinities died, everything they made died, too. Now Saypur is in charge and with the Divinities of the Continent gone, they rule over their once oppressors. Picking up a generation after the fall of Bulikov, it is illegal for the people of the Continent to know their gods, their histories, anything that may connect them to a past where they had ruled. Except the past is rearing its head. With the death of a Saypuri scholar, the past starts to come alive again and it’s up to Shara, a spy sent from Saypur, and her “secretary,” an enormous pale-skinned man named Sigrud, to figure out what’s going on. This is another one that began as a whisper and in a short amount of time gained an incredible amount of steam and speed. When I got my hands on this book, I tore through it in a weekend. Bennett builds a world equal parts Cold War spy mystery and epic fantasy. His world is beautiful and deadly and dark and lonely and still, full of miracles. On top of his jealousy-inducing worldbuilding, he has one of my favorite protagonists in recent reading: Shara, a short, dark-skinned woman with glasses who uses her mind to fight wars rather than her fists, (though granted, Sigrud easily takes up that torch and is another amazing breakout character). It stands alone just fine, though there is a sequel due. I’ve already lined up outside Bennett’s house to wait for it. Verdict: Definite Buy, Especially If You Enjoy Spy Thrillers, Fresh Epic Fantasy, And Oh Hey Look, Divine Miracles. Those Are Neat.